The Applications Olympiad is a challenge for those who take CAT or the ICDL or are otherwise computer literate. The participants have to solve a number of problems using a common office package and the data provided. ** Contestants are allowed to use the application of their choice, such as the Word Processor, Spreadsheet, Database and Presentation Tool. ** Most participants will use a popular office package such as Microsoft Office, Open Office or Libre Office. ** There is only one paper for all age groups. ** The competition is most beneficial if entire classes take part, but individual participation is also encouraged. 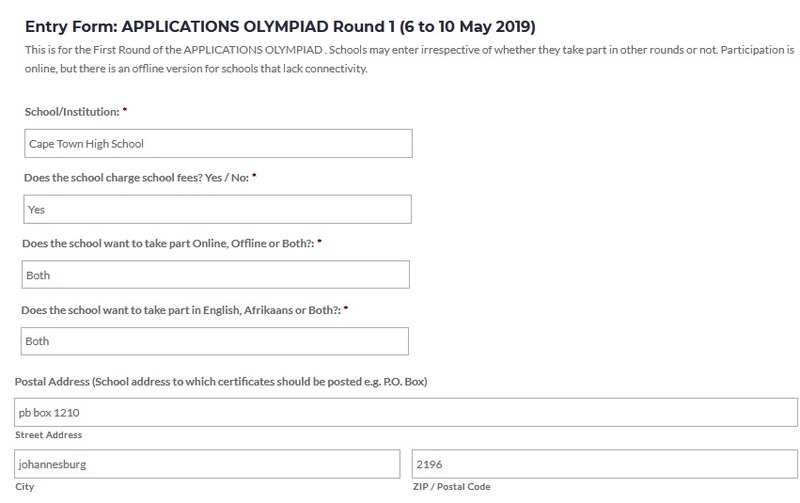 ** The Application Olympiad is available in English and Afrikaans. ** The First Round of the Applications Olympiad is written at local schools in the second term for one hour. ** Word Processing, Spreadsheet and Database skills are tested. ** Participants will be required to complete a number of application tasks under supervision in one hour. ** Each participant must have access to a computer. ** Participants may use any common application package, such as Microsoft Office, Open Office and Libre Office. ** Schools will have to make these arrangements themselves. ** Schools that take part online will have no marking to do. ** The results will be sent to them after the event. ** For schools that take part offline, papers are marked at school. ** The teacher in charge of the competition need not be an expert in computer applications. ** All the answers are simple numbers or single words and can be marked quickly with the use of the answer key provided. ** The Second Round of the Applications Olympiad is written at local schools in the second term for one hour. Word Processing, Spreadsheet and Database skills are tested. ** Invitation for the top 10 to 15 participants in SA to go to the Final Round at a central venue – all expenses paid. ** The best 10 to 15 participants from the Applications Olympiad Second Round countrywide will be invited to take part in the Final Round at a central venue. ** If two or more learners from the same school qualify, then either the one with the higher scores in Round 1 and Round 2 will be invited, or the school may run a tie-breaker and then decide who should be invited. ** Participants will have a choice of a limited range of Computer Application Packages which are suitable for this type of competition. ** The main contest runs over 5 hours on one day. ** Each candidate will be given a number of problems to solve in the allotted time. ** Evaluation will be done by a panel of experts. ** The competition uses a suitable central venue. ** Out-of-town participants are housed at a nearby bed-and-breakfast. ** This is for the First Round of the Applications Olympiad . Schools may enter irrespective of whether they take part in other rounds or not. Participation is online, but there is an offline version for schools that lack connectivity. Step 11 : Enter Fax No. 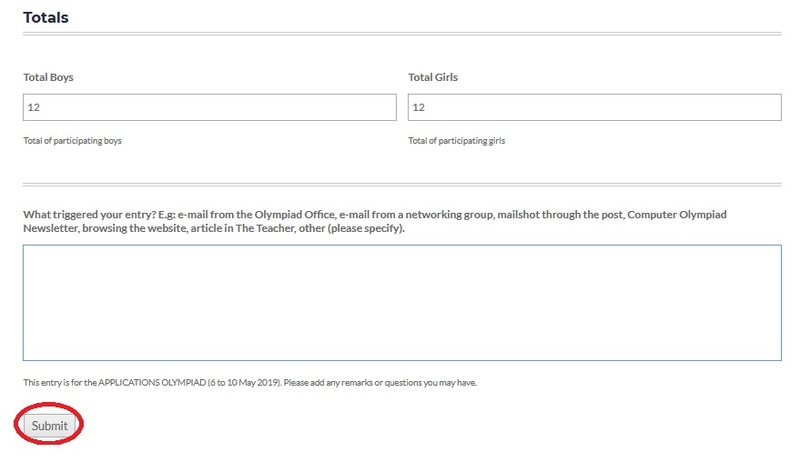 Step 16 : Click on Submit Button. The winning participants receive medals and cash awards and each participant also receives a certificate.